I rode the Hwy 7 bike lanes across the 404 interchange this week. York Region has worked in partnership with the Ministry of Transportation to make this a safer and more effective interchange for cyclists and motorists. Completed in Fall 2014, the bike lanes with green markings across the ramp mixing zones are among only a handful of such examples in Ontario (I only know of 403/Fairview in Burlington, and 400/Duckworth in Barrie). There were a few wet spots, and some stored snow was encroaching the bike lane, but the buffer provides some extra width for cyclists and I thought it was a relatively comfortable winter ride. A cyclist could easily use this commuter route year-round (though the left turn bike boxes were completely covered with snow). With MTO's #CycleON Action Plan 1.0 released in 2014, it appears that these types of interchange improvements will become the norm rather than the exception, making the crossings a lot less challenging by bike. All road users will benefit. 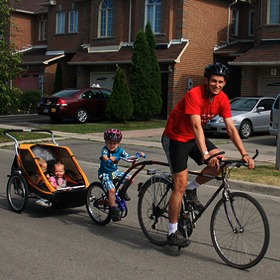 Sidewalk Cycling: to Ride or Not to Ride?